Jim Beatty, one of the greatest – and sweetest sounding – clarinetists in the history of American traditional jazz music, tells his story in this compelling memoir of his life and the times he lived through. Still Rambln’ is the iconic musician in his own words, “unplugged,” recounting the highs and lows of the musical career that took him from the bars of New York City to Royal audiences in Europe. Beatty’s autobiography tells of his difficult childhood in post – World War ll Jamestown, New York and how the discovery of the clarinet, jazz music, and the mentorship of jazz greats such as Omer Simeon and Wild Bill Davison embarked in him on a career spanning seventy-five years and performances to sold – out audiences across the United States and in Holland, Canada, the United Kingdom, Russia, China and even the King of Bulgaria. By recounting his own musical odyssey Beatty also takes the reader on a journey through the ups and downs of the American story, recounting the life of a boy in Jamestown New York, the racism he encounters with his Army band in Virginia during the 1950s and the battles with alcohol many of the musicians he’s played with in his career have lost. At its heart Beatty’s story is one of a jazz musician driven to perform, and so also offers the reader a tour of jazz history. We hear about the New York music scene of the 1950s, his tour with “Colonel” Jens Jensen’s Wolverine Jazz Band in the Bahamas in 1960, his move to Portland, Oregon, and playing with such jazz greats as Monte Ballou, Turk Murphy, Ernie Carson, Jim Goodwin and Bob Helm. Beatty also takes us through the jazz scene in the United Kingdom in the 1990s as he plays festivals across the country and with musicians such as Max Collie, Monte Sunshine, Phil Mason and the Big Bear Stompers.. Beatty developed deep and lasting friendships with many musicians, and notably talks about his wild times with Wild Bill Davison and Jim Goodwin, revealing never before revealed details about these two jazz giants that will enthrall fans and historians alike. 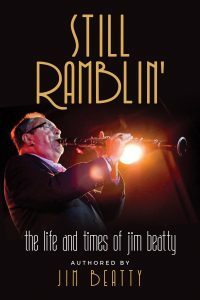 In Still Ramblin’ Beatty holds nothing back, and both the joys and excitement of a jazzman’s life and problems are revealed. But more than anything, Jim talks about musicians in the life of a musician. The man who has given us some of the most transcendent music over the last half – century as now given us a riveting autobiography.